much more complicated than we thought. And that’s good news. By 2010, Canada will be home to three million people diagnosed with type 2 diabetes. Unlike type 1 diabetes, which is an incurable autoimmune disease, type 2 diabetes (sometimes called adult onset diabetes) is a metabolic disorder that can often be kept in check, or prevented from occurring, through diet and exercise. But when it’s not controlled, type 2 diabetes comes at a terrible price, putting people at high risk for blindness, heart and kidney failure and a host of other ailments. Given the stakes, Dr. Rob Sladek and his co-investigators at McGill, Imperial College London, the Centre national de la recherche scientifique (CNRS) in Lille, France and the Université de Montréal already had much to be proud of when they identified four new genes associated with the disease last year. That their paper in Nature became the fifth most cited scientific article of 2007, according to the comprehensive science metrics and analysis website ScienceWatch.com, was really just (sugar-free) icing on the cake. But without some good luck and flexibility, the breakthrough might not have happened at all. Sladek, an assistant professor in the Department of Human Genetics and Endocrinology, explains that the team’s initial plan was to identify candidate genes using animal models. This would involve inducing diabetes in rodents, then identifying which genes seemed to have been activated or altered by the presence of disease. “If we’d gone with that approach, we would have found one or two genes, probably ones that were already known,” he says. While planning those experiments, “the technology got ahead of us,” and micro-arrays became available. With these devices, rapid scans of the entire human genetic code became possible, and so the team rapidly changed tack, adopting a “whole genome association” approach. By scanning the genomes of hundreds of individuals, whole genome association aims to use statistics to identify those genes that are associated with a specific characteristic. The pressure was high. 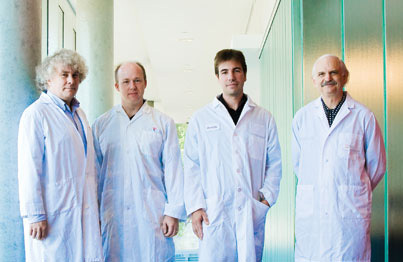 The team—including principal investigators Dr. Philippe Froguel, David Meyre and Christian Dina from Imperial College London, Dr. Barry Posner from McGill and Marc Prentki from Université de Montréal—knew they were in a battle with some scientific heavyweights to be the first to publish; Harvard’s Broad Institute, Britain’s Wellcome Trust and the National Institutes of Health in Washington, D.C., were all in the hunt as well. Fortunately, Sladek and his colleagues had access to the leading-edge technology and expertise of the McGill University and Génome Québec Innovation Centre (MUGQIC). They also had access to approximately 3,000 samples of DNA from diabetics, painstakingly collected and catalogued by the French DESIR (Data from the Epidemiological Study on the Insulin Resistance Syndrome) study group and researchers at the Institut Pasteur de Lille. Johan Rung, an MUGQIC bioinformatician, Alexandre Montpetit, Assistant Scientific Director of the Centre, and post-doctoral fellow Ghislain Rocheleau led the statistical analysis of the massive data sets. Rocheleau became the lead author of the resulting Nature paper. Team member and corresponding author Dr. Constantin Polychronakos, a professor of pediatrics and human genetics, explained that the number of samples, and the amount of detail that they knew about their donors—such as each donor’s weight, age of onset and medical history—allowed for the speed and reliability of the McGill team’s results. “We knew that obesity was a factor, but we wanted to know what else was important, so we narrowed down the search by focusing on lean diabetics,” says Polychronakos. Narrowing their search to lean diabetics meant that the McGill team was able to achieve a correlation that Polychronakos calls “orders of magnitude” better than that found later in their competitors’ studies. The thousands of samples were sent to Montreal, where they were run through the MUGQIC’s micro-arrays on McGill’s downtown campus. The team was thus able to locate the four genes, or at least “a street address, or apartment building for them,” says Sladek. Two of the four genes identified by the McGill team were confirmed by later studies from the competing groups, and these were also the most promising for future research. The remaining two share a genomic “apartment building,” which makes it much more difficult to determine their function. Polychronakos concedes that their correlation might simply be a statistical aberration. Both of the genes that were corroborated by the later studies were found to be important to pancreatic beta cells. One of these, HHEX, is an “on/off” switch that regulates protein expression. Figuring out its exact function is “one or two years away,” says Sladek, but they believe it is related to the development of pancreatic tissue. The other important gene, SLc30A8 (also known as ZnT8), is expressed only in pancreatic beta cells and is used to process zinc, which in turn is used to form insulin. While it is possible that these discoveries could, in the long term, lead to clinical treatments for diabetes—boosting zinc transport, for instance—what it really demonstrates is the complexity of the disease. Until two years ago, researchers knew of only three genes, and possibly a fourth, that were implicated in diabetes. Now it is thought there might be 50. “We’re going to start to learn that not all people have the same genetic basis for the disease,” says Sladek. “Even though we’re explaining a lot of things, to make a genetic test based on what we know would be a challenge. We really don’t know what all the variants are. The excitement of the genetic work comes from the possibility that it may be the first chance to start subdividing type 2 diabetes into different groups. The interesting thing in the next few years will be to see the differences between these sub-groups in terms of the rapidity with which the diabetes progresses, the difficulty in treating it, and whether specific drugs are better for treating, for example, type 2A or 2B or 2C diabetes. Thus, the research goes on. Sladek explained that his team is already following up on their Nature paper with cell cultures and mouse models. With these, they hope to better characterize the nature of the HHEX and SLc30A8 genes, perhaps pointing the way to correct their functions. Polychronakos sounds positively delighted at the increasingly complicated picture their work has begun to unveil. The techniques used to find HHEX and SLc30A8 are very broad spectrum, designed to find common variations. He believes that many diabetes cases will prove to be the result of uncommon mutations in an individual’s genetic code. While Sladek and Polychronakos weren’t aiming to make the scientific equivalent of the Billboard Top Ten, they’re justifiably proud of their achievement. This study was funded by Genome Canada, Génome Québec and the Canada Foundation for Innovation.